Important Changes: Unfortunately we have temporarily stopped processing orders for Tramadol. By registering you will be the first to know when this service is back up and running. Please enter your email address at the bottom of this page. This is a powerful pain relief medication, indicated for moderate to severe pain. It is only issued to patients when milder pain relievers are very likely to prove insufficient. Medicines such as this are used to treat chronic pain associated with conditions like fibromyalgia, rheumatoid arthritis and motor neurone disease. It has also been used to help relieve severe pain following surgical procedures. 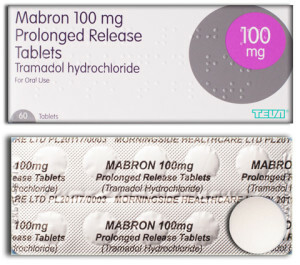 Mabron is the brand name for this medicine, which contains tramadol hydrochloride (otherwise known as tramadol). This version is a modified release tablet, and these work by discharging their contents at a slower rate over a prolonged period. This method of treatment provides sustained relief for those who may be suffering from constant, round-the-clock pain. Tramadol is what medical experts call an opioid analgesic. It functions by releasing chemicals which work along the same lines as endorphins, helping the brain to disregard pain signals. So, although the cause of pain may still be present, the brain is less aware of it. This is a very strong pain medicine, and it is vital before use to ensure that it is safe for you. Before you buy Mabron online, you will need to have your medical condition assessed by a doctor. For those who are pregnant or breastfeeding, or for those who have a history of drug- or alcohol-related illness, Mabron may not be suitable for use. Possible side effects include nausea, vomiting, heart problems and addiction. The information provided here is not comprehensive. For a full list of side effects and restrictions, you should consult the leaflet provided. We appreciate the need for discretion, which is why all of our shipments are made in packaging which is secure and unmarked. We always put the safety of our customers first. After placing your order, you will be presented with a health questionnaire, and a GMC-registered doctor will review your answers. If the doctor deems the treatment as being suitable for you, they will create an electronic prescription and send it to our dispensing pharmacy on your behalf.